It’s the truth – honest guv. 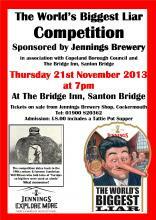 Thursday 21 November sees the return of Jennings' famous World’s Biggest Liar contest, at the Bridge Inn, Santon Bridge. Politicians and legal eagles are banned, but all others are welcome to pit their wits against some creative storytellers. So who can top Jack Harvey’s winning line from 2012 – that Cumbrians are 4% badger? To mark the occasion, Jennings have brewed their World’s Biggest Liar beer. 7pm, £8, includes Tattie Pot Supper, Tickets available from Jennings Brewery Shop. A soft, smooth gin, with a bright palate which is well worth trying straight. Langtons No.1 hails from Skiddaw in Cumbria, where two local lads, intent on creating a gin that reflected their roots, discovered a million year old aquifer, or underground water source. 40% / 70cl, £38, from Booths, Harvey Nicols, and specialist retailers. Over 300 ales are on show at this year's CAMRA Winter Ales festival in Derby, plus a selection of ciders and perries. With the Champion Beer of Britain having been one of the winners at the National Winter Ales Festival for the last two years in a row, this is your chance to taste a vast array of top ales. Keep in touch via Twitter - @WinterAlesFest and Facebook. Some counties just have all the luck. Not content with peerless views, inspiring foods and eateries, Cumbria also has one of the most vibrant craft brewing scenes. Showcasing this splendour, the Cumbria Beer Appreciation Group is meeting 3 November for its third beer matching dinner in the delightful surroundings of the Fayrer Garden House Hotel. Renowned for the quality of head chef Eddie Wilkinson's cooking as well as its colourful gardens, this is no three-course affair. Visit Ulverston on the southern edge of the Lake District, the birthplace of Stan Laurel, to track down an altogether newer cultural icon: the Ulverston Brewing Company. Known for its penchant for festivals and its thriving artistic community, this smart grey-slated market town was home to a certain Arthur Stanley Jefferson as he was called before moving to America where he found fame as Stan Laurel. Fantastically aromatic, with violets, cloves, cinnamon, vanilla, it's incredible to think that this all comes from the blend of hops. The palate sports a complex mix of dark roasted malts, with vanilla coffee flavours, spicy fruitcake, and bitter coffee on the finish. 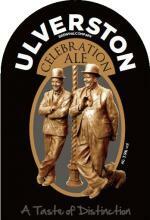 The first Ulverston beer not to be named after a Laurel & Hardy film or phrase, instead Celebration Ale was brewed to commemorate the unveiling in 2009 of the famous pair's statue by Graham Ibbeson outside the museum of the same name. 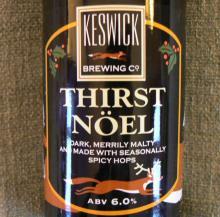 3.9%, available in pubs throughout the north-west and in nine-gallon casks from the brewery shop. Larger orders welcome. 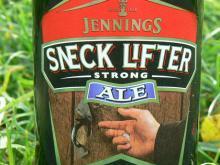 First brewed in 1990 as a warming winter ale, Jennings' Sneck Lifter continues to do the trick. There's a great tale behind the name – a "sneck" is that last sixpence with which you lift the latch of the pub before using it to pay for your pint, the hope being that you'll find your mates in the bar and they'll buy your next round. 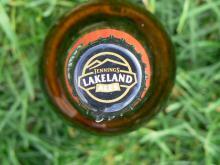 Amber in colour and mellow in mood, Jennings Lakeland Stunner has light citrus aromas and is smooth and clean on the finish. Perfect with light foods and fish, and for whiling away the afternoon in your pub garden of choice.